Oh to have a weekend driven by the Moon in Taurus — which we do, as of 8:51 AM ET on Saturday. Taurus seeks material comfort and security: food, drink, a snuggle with your sweetie. Big ideas about faith, healing, spirits of all kinds and sweet, sweet music may also be integrated easily into your weekend plans, courtesy of Sunday’s harmony between the Sun and Neptune (exact at 10:42 AM ET), and Monday’s challenge (square) between Mercury (in regal Leo) and Jupiter, exact on MONDAY at 5:14 AM ET. Any caveats? Sure. Saturday at 12:45 PM ET, Moon meets up with Uranus, suggesting a disruption in the Taurus need to keep things as they are “supposed to be.” The next few hours are stabilizing, as the Moon harmonizes with Saturn. However, a clash of wills may arise around midnight, as retrograde Mars in rebel/freedom-seeking Aquarius squares the Taurus Moon. On SUNDAY, Moon squares Mercury (how we need to think and communicate) and opposes Jupiter between 6:40 AM ET and 8:31 AM ET. Sounds like a probable Tweet storm to me, driven by the fantastic/dreamy potential of the morning’s Sun-Neptune trine. The rest of the day flows beautifully, with the Moon in harmony with Neptune, Sun and Pluto. No sleeping in on Monday. The Taurus Moon will be void between 12:10 PM ET and 12:58 PM ET. Then it moves into infojunkie Gemini, giving us plenty to talk about for the next few days, including, but not limited to: P45’s pick to replace Anthony Kennedy on the Supreme Court. Oh my. Last weekend featured a humanitarian, revolutionary Aquarius Moon, coupled with a square between rebel Uranus and Mercury. It was an apt backdrop for thousands of people taking to the streets to protest the separation of immigrant families at the U.S. border. Meanwhile, in Mexico, “Lopez Obrador, an Atypical Leftist, Wins Presidency in a Landslide.” Now this is a fun story because we have a birth time for Andres Manuel Lopez Obrador (a.k.a. AMLO), and as we know before we even look at it, the horoscope is hot. AMLO is a Scorpio driven by the Moon in Aquarius, fronted by a Virgo Ascendant. The Moon’s engagement with Uranus and Pluto suggest a humanitarian vision needing to disrupt the status quo. The Virgo Ascendant suggests a need to been seen as as perfectionist, seeking to make things right. Last month’s New Moon at 22 Gemini was on his 20 Gemini Midheaven, planting seeds in matters of profession and public status. 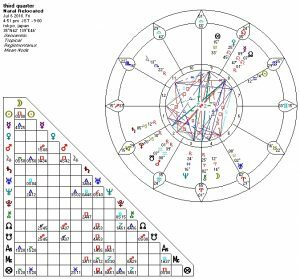 How interesting that his 20 Scorpio Sun is being expanded three times by transiting Jupiter and that Jupiter sat on his 23 Scorpio Mercury in late February and early March. Mercury rules his Ascendant and Midheaven, so we see the potential for an expanded reach of ideas, impacting status and image. 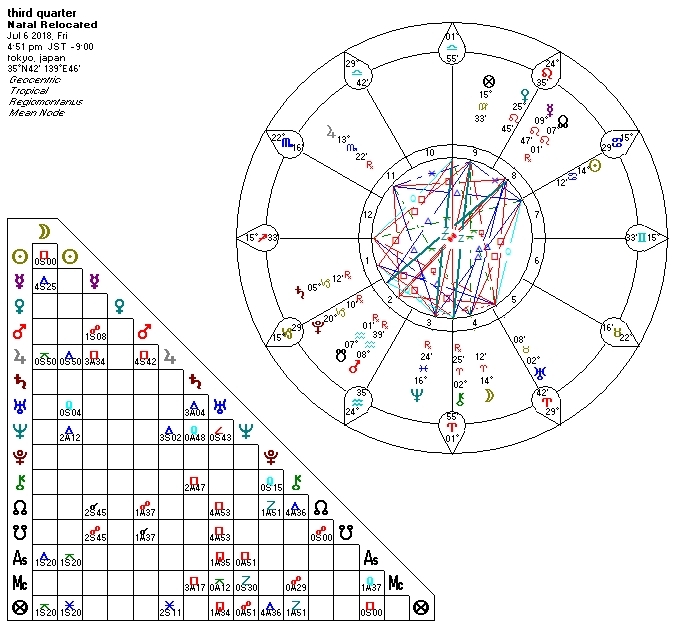 It’s interesting to note that transiting Mars was opposing his 8 Aquarius Moon for much of last month, and that transiting Saturn has been squaring his 7 Libra Mars. Many who know just enough about astrology to be dangerous will moan and groan when they think of transits from these two planets. Yes, Saturn can be a downer, but it also reflects opportunity for focus, discipline and ambition. Yes, Mars can be provocative and suggest conflict, but it can also reflect opportunities for assertion and courage. Also of note: transiting Uranus squaring AMLO’s natal Venus-Saturn conjunction at 2 degrees of Scorpio. This suggests a need for innovation and change in matters of social expression, values, structure and authority. I don’t know what was going on in AMLO’s horoscope when he ran for president twice before. Astrologically, we can see why his third effort worked like a charm. UPDATE: Scott Pruitt, whose pink slip was only a matter of time, suggested by patterns in his horoscope noted in prior forecasts. What finally pushed him out the door, to the sound of much rejoicing in the land? The second hit of transiting Mars opposing his Ascendant. The first was on June 15th; the second happened today, July 7th; the third happens on October 6th. For the rest of the year he may also look forward to hits two and three from transiting Pluto to his natal Saturn, along with hits two and three from transiting Saturn to his people-pleasing, conflict-averse Libra Moon. Not exactly a walk in the park. Cry me a polluted river. When Mars is retrograde, it is not an opportune time to initiate a conflict, e.g., a lawsuit, divorce or war. Thus we may anticipate that the trade war against China initiated by P45 this week is not going to end well for the U.S.
Oh…this just in…one of the disruptions anticipated today around 12:45 PM ET, reflecting the Taurus Moon’s meet up with rebel Uranus: Chicago protesters have shut down part of a downtown freeway — typing this at 12:25 PM ET. What are they protesting? True to the Sun-Neptune (peace, non-violence) trine, they are protesting….gun violence. Meanwhile, supporters of gun rights held marches in ten cities…and “lamented the low turnout,” according to the Chicago Tribune. Coincidence or conspiracy? Here’s another disruption the P45 peeps may hope no one noticed — since it was announced on a Saturday during a holiday week: “Health Insurers Warn of Market Turmoil as P45 Suspends Billions in Payments,” — illegally, btw. Initial contemplation of the cruel consequences of this brazen act left me feeling numb for a spell — until I remembered I’ve been writing about the Affordable Care Act for years — and on January 17, 2017 I predicted that the Affordable Care Act would be experiencing an anguished streamlining and further disruption in the summer and fall of 2018. I don’t know about you, but looking at the horoscope for ACA and understanding the potential suggested at this time does give me a measure of resolve to soldier on. Midterm elections are on November 6th. There will be primaries and local elections before that date. Are you registered to vote? Have you moved since the last time you voted? You need to update your registration. Pass this helpful voter registration link on, and I will see you at the polls. Because if you don’t vote, somebody else will. This page on that voter registration site will tell you what elections will be held in your district this year. Meanwhile, I’ll be looking forward to a new feature on Beth Owls Daughter’s blog. You all know she does her wonderful Tarot Card of the Week write-ups on Mondays. Last week she introduced Freedom Fridays. If you’re not inclined to be a frog sitting complacently in a pot of hot water (until it’s too late), you may enjoy the wisdom Beth will share. On Monday I anticipated that we were likely to see a new scandal involving sexual abuse. Did we? Yes. Rep. Jim Jordan (R-OH) is a former University of Ohio wrestling coach who made news this week for repeatedly denying that he knew that a physician working with the university’s wrestling team was sexually abusing students. A number of wrestlers stated that Jordan was told — and did nothing. This is a developing story…and it is interesting to note that transiting Saturn has been putting a streamlining squeeze on Jordan’s natal Venus at 8 Aries, suggesting a need to get real in matters of worth and social expression. Transiting Saturn conjunct his South Node suggests an opportunity to release an outdated pattern in which expediency and status took priority over emotional sensitivity and caring. It will be interesting to see where this case is at around October 10th, when transiting Mars catches up to Jordan’s natal Mercury at 10 degrees of Aquarius…AND transiting Venus turns retrograde at 10 Scorpio. We do not have a birth time for Jim Jordan — all we have is Feb 17, 1964 in Urbana, IL. Last year former House Speaker Jim Boehner called Jordan — who is a member of the House Freedom Caucus — a “legislative terrorist.” Well, Jordan does have Sun, Mars and Saturn all together in rebel Aquarius, and those three planets together does suggest a strong force of will. UPDATE: North Korea. Remember when P45 tweeted at 5:56 AM ET on June 13th that North Korea was “no longer a threat?” I looked at the chart for that time — set at Andrews AFB — and rolled my eyes into the next county. It is possible to determine if a statement made — or a rumor heard — is true, by looking at the horoscope for the moment the statement is made. Suffice it to say that it is no surprise to be reading stories about North Korea’s apparent unwillingness to actually dismantle its nuclear whatevers. GOOD NEWS! Croatia trounced Russia in the World Cup — and the Moon wasn’t even void — so no upset by an underdog here. GOOD NEWS! During July 4th’s all-day Moon void in Pisces, when everyone should have just been going with the flow, being empathetic, compassionate and feeling secure in the belief that we are all one whilst hanging at the pool, a few folks broke the Moon void rule of not making mountains out of molehills. One was “ID Adam,” who called the cops on a neighbor — a woman who refused to show him her ID when he challenged her right to be at the neighborhood pool (residents are given key cards to access the pool). A video of the incident went viral, and ID Adam is now out of a job. If only he had apologized and invited his neighbor over for cocktails. If only. In a similar incident, a property manager also lost her job. GOOD NEWS! “Lions Eat Rhino Poachers on South African Game Preserve.” Because they can. What’s going on in your horoscope? Here is the 411 on personal consultations. Yes, I am still offering that Mars Retrograde Special — $48.88 for a brief analysis of what assertive energies Mars is likely stirring up in your horoscope between now and this fall, and how to handle potential delays and frustration.